At Moving Ahead Services, we understand your piano is valuable and delicate, and requires attention to detail during any move. Our trained movers understand that your piano is not just another piece of furniture, but that it’s a finely tuned instrument most likely with years of history attached to it. 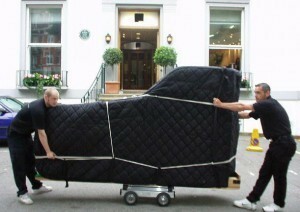 Our team of experienced piano movers can move your piano from one home to the next, or relocate to a different room within your home safely. When you hire Moving Ahead Services to move your piano, you can have the confidence that your prized possession will be safely transported to your desired location. From new Baby Grands to vintage family heirlooms and everything in between, the expert piano movers Moving Ahead Services have successfully moved hundreds of pianos in Ohio and beyond! Complete protection procedures to prevent any scratches or damage. Protected vehicle transportation to ensure seamless re-location. When moving a piano, many different factors impact the plans in place to ensure your piano is moved safely, and without any damage to the instrument itself or to your home. Different manufacturers feature different details that require careful planning and consideration. Couple that with the logistics of moving such a large item and experts quickly move up the list as a necessity! Trying to relocate your piano yourself can be dangerous and costly, and each move we complete includes the necessary equipment to protect and move your piano the right way. Give us a call today to plan your move, or to re-arrange your piano within your home. Our experts will walk you through the planning process, including how to properly prepare for your moving day! Take comfort in our experience and attention to detail, your piano is in good hands. Licensed, bonded and insured professional piano movers serving customers in Ohio.